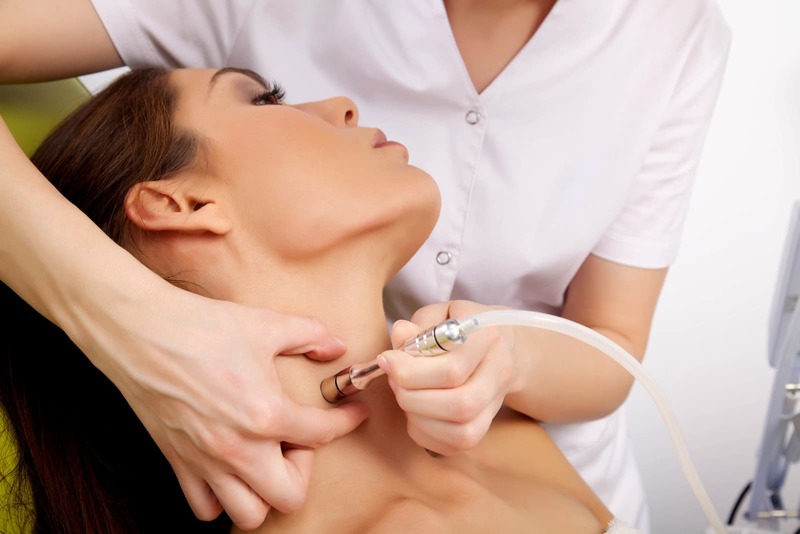 Microdermabrasion, or microderm for short, is a non-invasive, no downtime polishing of the skin. It is a mechanical exfoliation treatment that gently removes the outermost layer of “dead skin,” called the stratum corneum and stimulates collagen production and new cell growth. It is a natural way to exfoliate the skin without chemicals and lasers. This treatment deeply exfoliates and will clean clogged pores while restoring skin and helping to fight the signs of aging, hyperpigmentation, sun damage, brown spots and helps repair the skin by reducing the appearance of acne scars, fine lines and wrinkles. Our trained and knowledgeable Aesthetician can help discuss the best treatment options for your skin. After treatment, the skin will become very soft and smooth and literally diminishes imperfections without damaging the skin’s integrity. This takes place over several treatments. Microdermabrasion will also prepare your skin for other treatments including skin rejuvenation and chemical peels therefore enhances the end results. Because there is no dead skin hindering, nutrients and treatment products are allowed to better absorb into the skin, increasing their effectiveness. There is usually no recovery time needed after the treatment and you can quickly go back to daily life. We use a Diamond tipped wand to abrade the surface of your skin. Unlike crystal, the diamond wand can be used around the mouth and eye area, where the first signs of lines and wrinkles usually appear. These critical areas can be abraded more accurately and efficiently with a diamond wand. Using crystal-free diamond microdermabrasion offers all the benefits of microdermabrasion and eliminates the danger of aluminum oxide dust being embedded in the skin or inhaled. A series of four to eight microdermabrasion treatments are recommended for optimal results.